Sunday, October 7, 2018, 9 a.m.
APA California presents its annual Statewide Conference to provide educational and networking opportunities for its members. Our popular conferences attract planning and allied professionals from throughout California and the United States. 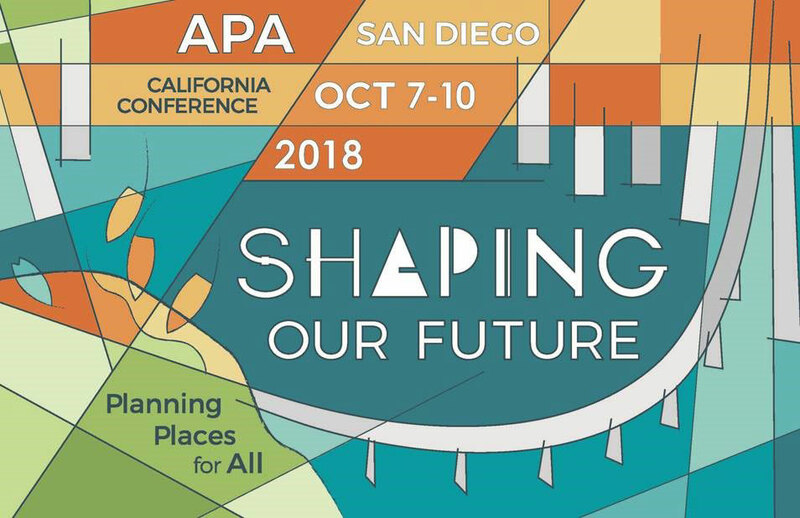 The highlights of the 2018 APA California 'Shaping Our Future' Conference include insightful plenary speakers and conference sessions covering pertinent California planning topics such as: affordable housing, climate change, green communities, community outreach, policy planning, transportation, and new technologies. The conference program includes practical "nuts and bolts" sessions, sessions with Law CM and Ethics CM credits for AICP members, and in-depth professional development training sessions. Additionally, the conference offers informative mobile workshops to local areas to explore interesting development projects and planning case studies. The conference also features the annual APA California Awards Ceremony and the California Planning Foundation Auction to fund scholarships for planning students. Single/Double rates are $216 plus current state and local taxes of 12.695%. Rates are in effect three days before and after the official conference dates of October 7-10, 2018. Rates include complimentary internet in sleeping rooms and public spaces and 20% discount on parking at the prevailing rates. A deposit equal to one night's room and tax will be charged to your American Express, VISA, Diner's Club, Master Card, Discover, or Carte Blanche along with the expiration date on your card. Individual Call-In: Attendees can call-in reservations directly with the hotel by calling: 1-877-734-2726. Be sure to identify yourself as an APA California conference attendee when booking your room to ensure you receive our discounted rate and APA California receives credit for your stay. The cutoff date for the hotel is Friday, September 14, 2018. Book early to secure your reservation. Neither the Sheraton or the Chapter can guarantee you a room after that date. Guests may cancel a reservation up to 72 hours prior to arrival date without penalty. After that date, the hotel will retain the first night's deposit posted on your credit card. An early departure fee of $100.00 may apply to APA California guests should checkout occur prior to the confirmed checkout date. The confirmed checkout date shall be that date confirmed by our attendees upon check-in at the hotel. GROUP DISCOUNT: One free registration is available for every ten (10) FULL conference registrations from a single public agency or private firm. One-day registrations are not included in the 10 qualifying registrations, and the free registration does not include the additional cost for mobile workshops, pre-conference sessions or event tickets. The minimum 10 registrations exclude student registrations and complimentary registrations included with sponsorship packages. * Young Planner: To qualify you must be an APA Member or California Chapter Only member and not be out of school more than 6 years & be under 35 years of age. ** By registering for the student rate you certify that you are currently enrolled full-time or graduating June, 2018. All sessions and events are included EXCEPT for the Opening Reception which is available for an additional fee. IMPORTANT: When you register please RSVP by selecting the complimentary events you will be attending. To cancel, change or transfer your registration e-mail registrationchanges@planning.org by September 7, 2018. Cancellations receive a full refund less a $50 administrative fee. No cancellations are permitted after September 7, 2018 but registrations can be transferred for a $25 fee. So You Want to Be A Planning Commissioner? The Great Debate: Can Housing in California be Affordable and Environmentally Conscious? Diversity Summit: Moving Towards Transportation Justice: What Can Planners do to Meet the Needs of Disadvantaged Communities? School/City Planning Interface: Can't We All Get Along? Not a member yet? Become a APA California Chapter-Only member today for $115 and pay the APA California member rate!